Now I want to go back to quantum mechanics for a bit and what better way than by playing card games. 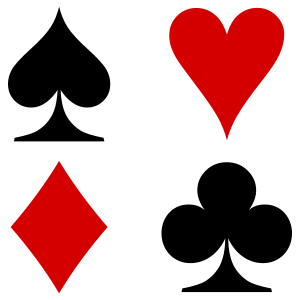 To this day I enjoy a type of Whist game, called Romanian Whist and one variant on this is when on the one games you get a card and you place it on your forehead without looking at it. Each player can see all other player's card values, but not his own. So let us now imagine the following "game": there are three players, and each is dealt a card. The cards could be either red or black as below. Each player places his/her card on his forehead and is able to see the other two player's card color but not his own. Then each player tries to guess the color of their card. The guesses are done simultaneously and independently. The game is won if everyone guesses correctly. What is the best strategy which maximizes the chances of winning, and what is the maximum probability of success? So what does this have to do with quantum mechanics? If you recall Bell's theorem, quantum mechanics is all about correlations which cannot be explained by shared randomness. But what if some measurements are allowed to be discarded? (This is called the detection loophole). Can we achieve higher correlations? So now in the game above let's change the rules a bit: each player is allowed to enter a guess or abstain. The game is won if at least one person makes a correct guess and there are no incorrect guesses. What is the maximum possible chance of winning the game under the detection loophole variant? What is the best strategy and what is the maximum chance of winning the game when everyone is forced to take a guess? What is the best strategy and what is the maximum chance of winning the game when you are allowed the freedom to answer or not? I got this problem from the internet and I will not reveal the source this time because they also have the solution. Do not try to search for it because I restated it on purpose to prevent spoiling the fun of solving it, but I will give full credits next time. You will be surprised to find out just how much better the odds become when skipping an answer is allowed.